The North American Monsoon is caused by an area of high pressure that moves northward during the summer months and an area of low pressure (forming due to intense surface heating) over the Mexican Plateau and the American Southwest. This configuration draws moisture from the Gulf of California and eastern Pacific inland, leading to heavy rainfall. The monsoon begins in late May to early June in southern Mexico and quickly spreads along the western slopes of the Sierra Madre Occidental, reaching Arizona and New Mexico in early July. For the Flagstaff area, the monsoon generally begins around July 3, though onset varies greatly due to topography. For areas to the east (e.g. Doney Park), onset dates remain fairly consistent, while the onset dates for areas to the west (e.g. Fort Valley) are variable. For example, Fort Valley may begin to experience the monsoonal rains as early as June 20 or as late as July 10. 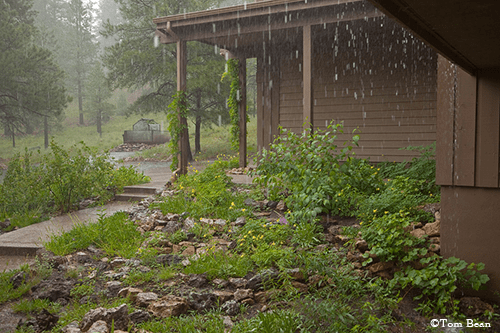 In contrast, Doney Park generally begins to experience the monsoonal rains within the first week of July. In comparison, the departure dates of the monsoon are far less consistent, and can be calculated using various thresholds. As such, the following dates should be used as guidelines only and are given to seasonal variability. Assumption: Chance of daily rainfall greater than 20% for two (or more) days. Assumption: Less than 30% chance of below-freezing temperatures for two (or more) days. Assumption: Chance of rain greater than 20%; chance of freezing temperature less than 30% for two (or more) days. Click for more on the Arizona Monsoon. — statistics compiled by Dan Stewart.